I spent all three days at Parc Jean-Drapeau meandering my way through the crowds to catch my favourite bands. I twisted and shouted to an envy-inducing roster, including FUN., Of Monsters and Men, Franz Ferdinand, Florence + the Machine, Justice, Young the Giant, Brand New, Little Dragon, Adventure Club, Passion Pit, Santigold, Bloc Party, M83 and Keys n Krates. I also caught the tail end of few others including the Shins, The Weeknd, Sigur Ros and Knife Party. Phew, that was a long list! While most people are talking about the headliners, I actually enjoyed the smaller sets the best and I was pleasantly surprised by a few of my high school day favourites. Oh, nostalgia! Public transit is the way to go! The North American company Megabus offers regular service to Montreal from Toronto at a reasonable rate compared to Canada’s rail system Via Rail. A one-way ticket costs anywhere between $1 (yes, you read that right!) and $50 depending on the date, deal and demand. Seeing as it was a summer long weekend and a festival one for that matter, I paid $100 round-trip to Montreal. Not too shabby. Reduced rates often come with a few hiccups including longer rides and wait times, but it’s nothing the budget backpacker or traveler can’t handle. While in Montreal, the Metro system is efficient, cheap and reliable ($3 one way, $5.50 return). Osheaga is easily accessible using public transit, but expect the masses and buy your Metro tickets in advance. Hostels are close to my heart (and budget), but I was eager to switch things up a bit in Montreal and stay at the Hotel Travelodge Montreal Centre (50 René-Levesque West), a top budget choice hotel. I spent more time practicing my French, eating tasty meals, listening to live music and getting lost in Montreal than lounging in the room, so I didn’t mind the small space and lack of amenities. The two main things that matter most are cleanliness and location and this place fit the bill. The staff is very accommodating and friendly as well, which is a bonus in my experience. In fact, if you’re traveling in a small group, the Travelodge offers family rooms with bunk beds that are cheaper than booking individual dorm beds. There are also updated rooms with a small kitchenette, so you don’t break the bank from eating out all of the time. I only ate dinner at the festival and it was more by necessity than choice. There were a few tasty food tent options, including Chili Hamburger Bar and Kono Pizza. Poutine (thick-cut fries smothered in gravy and cheese curds), Montreal-smoked beef sandwiches and pizza cones were the highlight dinner choices. Everyone and their drummer knew it, so the lines were viciously long during peak hours. Coming soon: Montreal’s Top Cheap Eats guest post on the Hostelbookers Blog. Right around the corner from Chinatown and hidden amidst the corporate chains awaits Café Santé Veritas (480 Boulevard Saint-Laurent). It’s my personal opinion that espresso always tastes better using a manual machine and the barista definitely knew what he was doing. Try the strong iced Americano with milk on a scorching summer day. Another great coffee option is the Euro-style Café Olimpico in the Mile End neighbourhood of Montreal (124 Rue St-Viateur Ouest). The barista playfully whips up your favourite espresso-based drinks while chatting up regulars and newcomers alike. The rich and foamy cappuccino rivals any cup found in the streets of France, but the iced latte leaves something to be desired. At Osheaga, I was disappointed to see that the festival only offered Budweiser beer. I’m a beer gal and I like variety. Thankfully, cocktails and other boozy selections were also available to avoid bloated bellies. At one point, the bartenders were selling shooters of Grey Goose for only $4.00. Good luck ordering low-shelf vodka shots for that price in Toronto. If you can muster the energy after a long festival day, Montreal is chalk-full of bars, lounges and nightclubs to suit your nightly needs. Réservoir (9 Avenue Duluth Est) is a great option for a terrace romance overlooking vibrant cobble-stoned Duluth Street. The ambiance is bohemian-chic and the indie music isn’t too loud to have a conversation over the candlelit tables. I shared one of Réservoir’s micro-brews called Saison, a strong Belgian-style blonde beer with a spicy twist (750 ml bottle for $16). It’s easy to find a place to dance in Montreal. Just walk up Saint-Laurent Boulevard or Rue Saint-Catherine and let the music guide you. Don’t shy away from peeking down the side streets for more mingling with local Quebecers. Montreal is great for exploring on foot. Each neighbourhood is a microcosm of distinct cultures and unique vibes full of surprises around each corner. The Mile End, Le Plateau, Old Montreal and Chinatown were just a few of the ‘hoods I meandered through. The Mile End is perfect if you enjoy vintage clothing and cafe culture, while Le Plateau is an ideal locale for a picnic in the park. Old Montreal has the most European feel to it with cobble stoned streets and historic architecture. It’s the spot if you prefer urban-chic restaurants and lounges and mingling with the Mad Men type. Last but not least, tiny Chinatown is a free-for-all of imported trinkets, unique smells (both good and bad) and authentic Asian dishes which remind me of the streets of South East Asia. Check out the Melissa To and Fro Facebook Page for extra photos from my trip to Montreal and the Osheaga Music and Arts Festival. 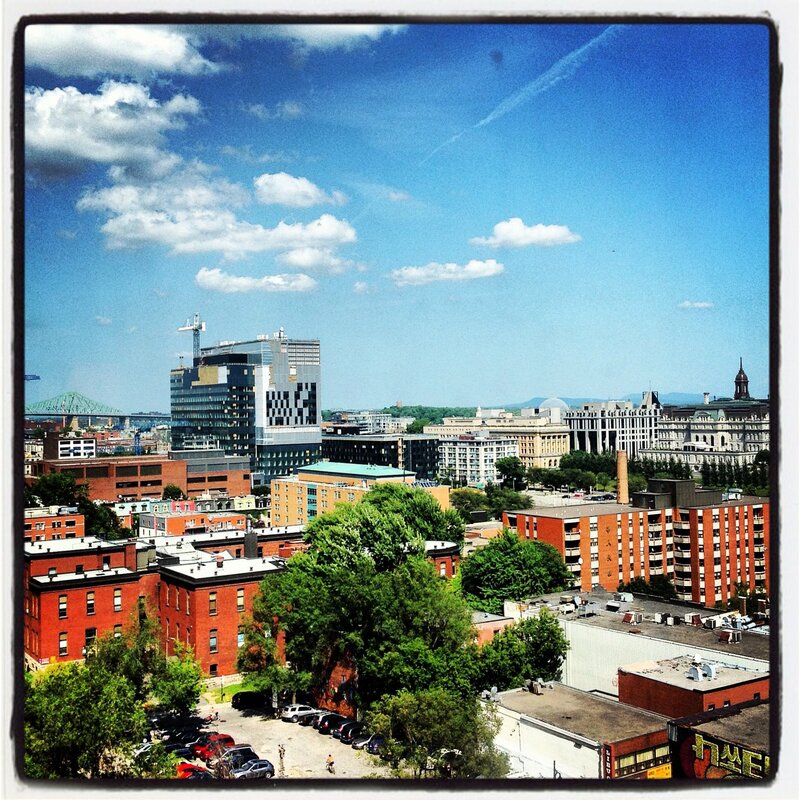 I’d like to thank Tourisme Montréal and Tourisme Québec for hosting my stay and providing me with an amazing itinerary. I ❤ Montreal. Yes Please!! And no rush, I won’t be there until Nov. 30th. Makes me miss Montreal and our wonderful trip already! You touched on so many great things Melissa! Totally! It’s a great vacation spot for a girlfriend getaway. Check back soon for the Cheap Eats post. Wow! Sounds like an epic trip to Montreal, and those are some great photos on your Facebook page as well! Thanks Alanna! I can’t wait to bring the new cam with me for the RTW trip. Greatttttt post it is……I have never been came into such a great information..A bundle of news about food fest altogether..It’s a very shameful thing for me that i have been here since a long time..But never experienced the joy of the food festivals yet..Surely i’ll go for it on my next holiday..
Osheaga is actually a music festival, but there are some tasty treats available onsite. Montreal, in general, is a great place to tantalize your taste buds! I haven’t been to Montreal in a LONG time. I really need to go on a cross Canada road trip. I’ve love to go back to Montreal. Thanks for your comment! Before this summer, it had been over 4 years since I visited Montreal. A visit was long over due! I haven’t been to Montreal but I really want to soon. Everything you describe sounds so European. I would love it. You must visit! It’s like a little slice of France… Thanks for stopping by!